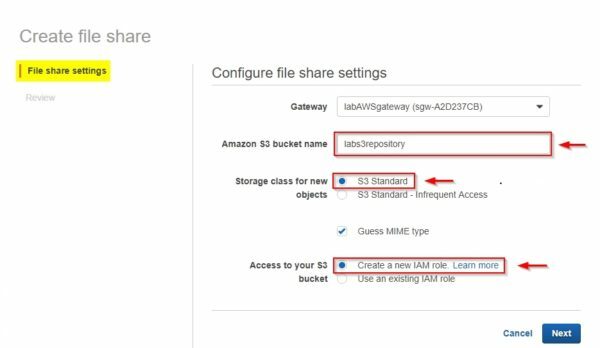 If the used backup software doesn't support a direct access to Amazon S3, you need to configure an AWS Gateway in your infrastructure to access the S3 objects in AWS environment. 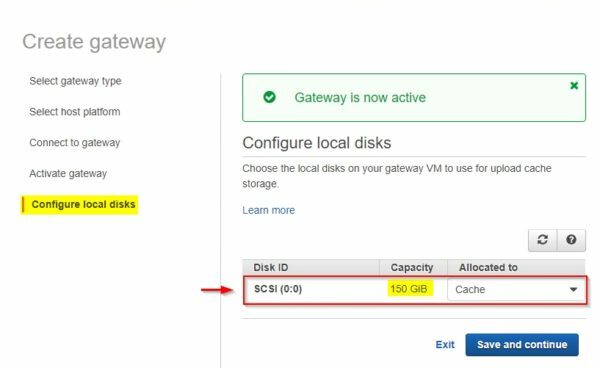 An AWS Gateway is basically an appliance available in different platforms (VMware, Hyper-V, Amazon EC2) that connects an on-premises software appliance with cloud-based storage. 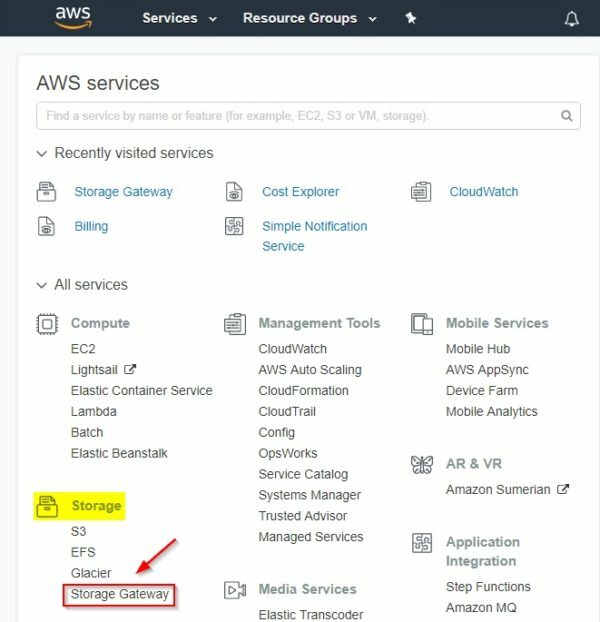 Login to the AWS Management Console and select the Storage Gateway option under Storage area. 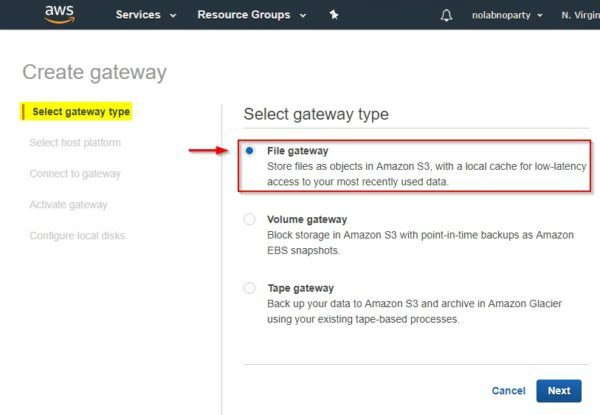 File gateway enables you to store and retrieve objects in Amazon S3 using industry-standard file protocols such as Network File System (NFS). 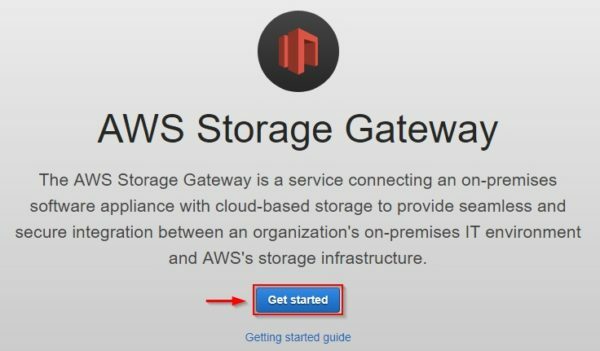 Click Get started to begin the AWS Storage Gateway configuration. 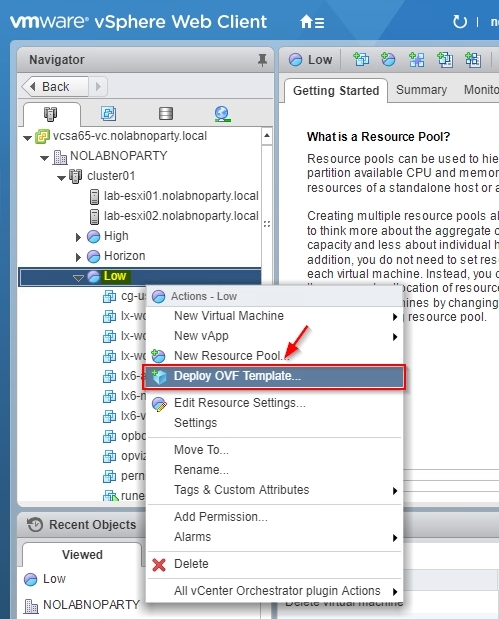 From the Select gateway type tab, select File gateway and click Next. 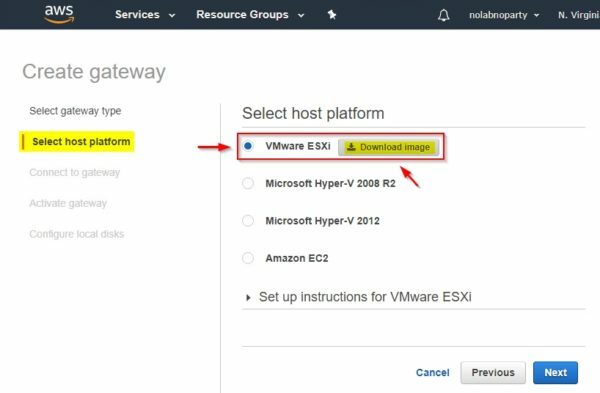 Select the host platform to use (in the example VMware ESXi) and click on Download image button. Click Next when download has been completed. 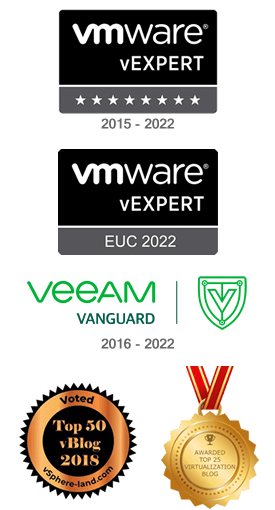 Before proceeding with next step, we need to deploy and configure the AWS gateway appliance in the virtual infrastructure. Select the correct Destination Network and click Next. 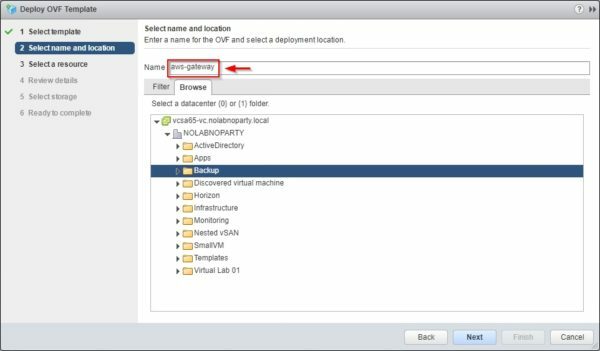 Once the appliance installation has completed, right click the VM and select Edit Settings. 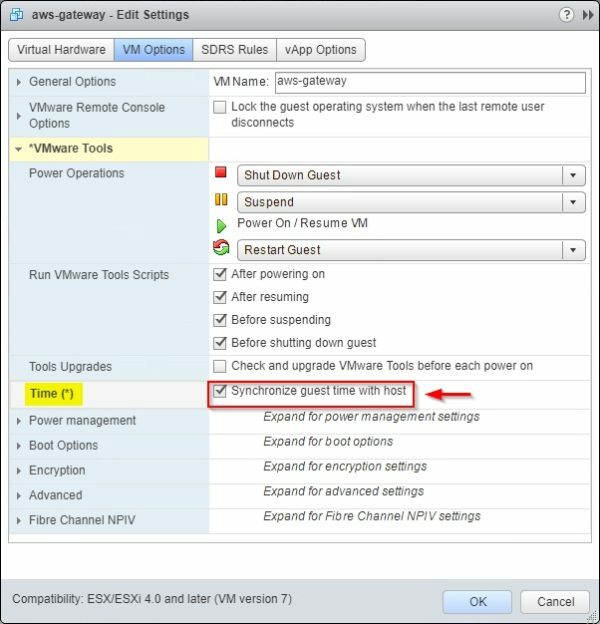 Go to VM Options tab, expand VMware Tools and enable the Synchronize guest time with host option. 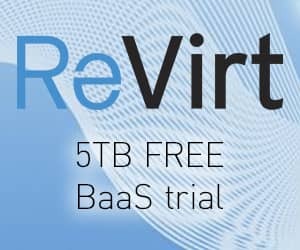 Since file gateways require at least one dedicated disk as a cache storage, go to Virtual Hardware tab and add a new Hard Disk device. 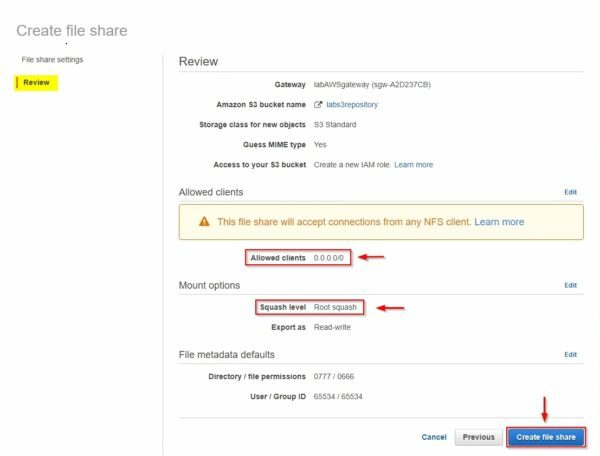 Cache storage acts as the on-premises durable store for data that is waiting to upload to Amazon S3. 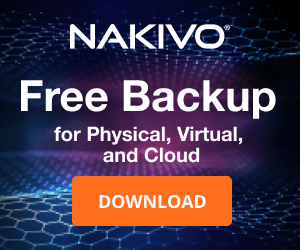 You should allocate at least 20% of your existing file store size as cache storage and it is recommended to have a disk size of at least 150 GB. 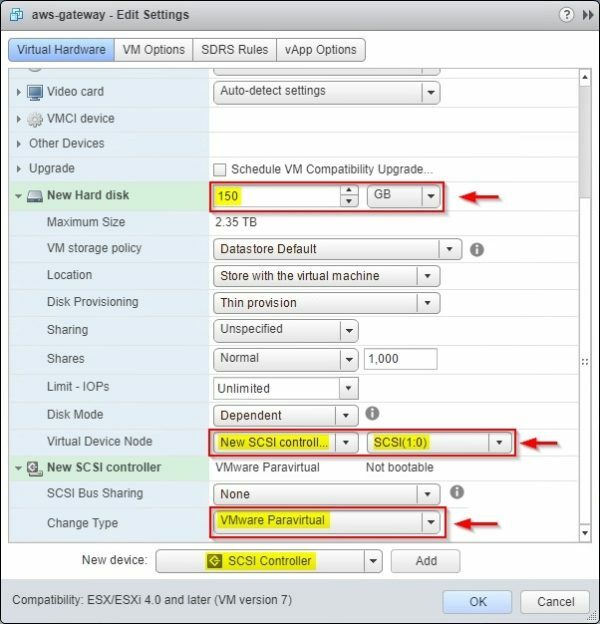 Add a new SCSI Controller and set the type as VMware Paravirtual. 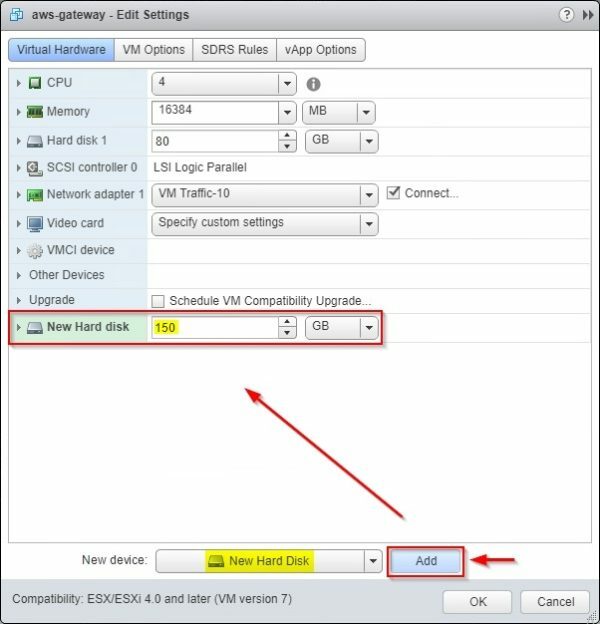 Assign the SCSI Controller to the created new hard disk. 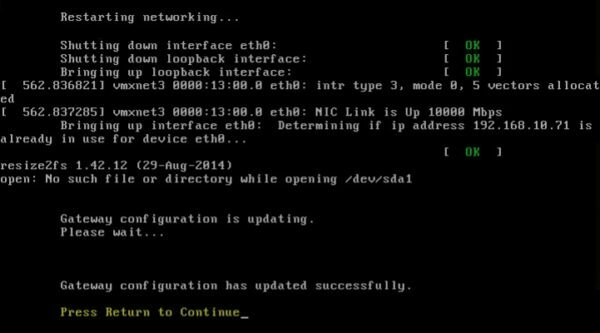 Click OK to save the configuration. 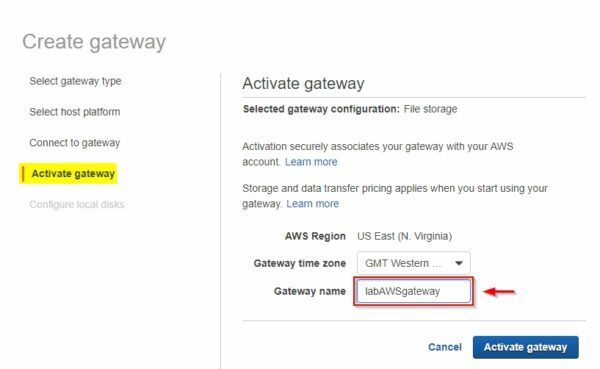 Right click the AWS Gateway appliance and select Power > Power On option. 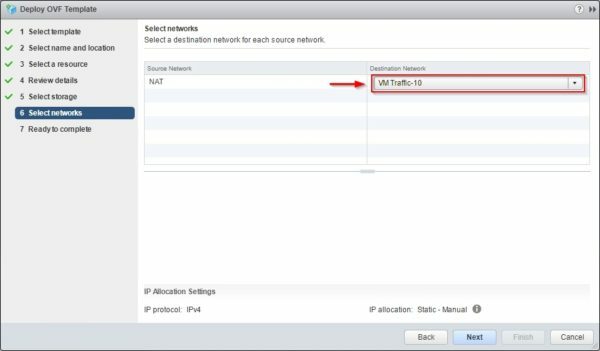 Access the appliance console in order to configure the network parameters. Enter the default credentials sguser/sgpassword to login. 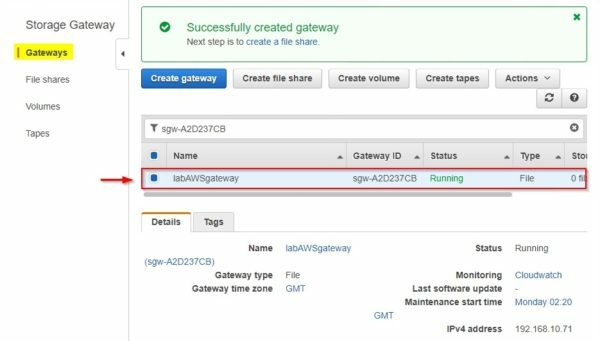 The AWS Gateway appliance configuration has been completed successfully. Enter x to exit the session. 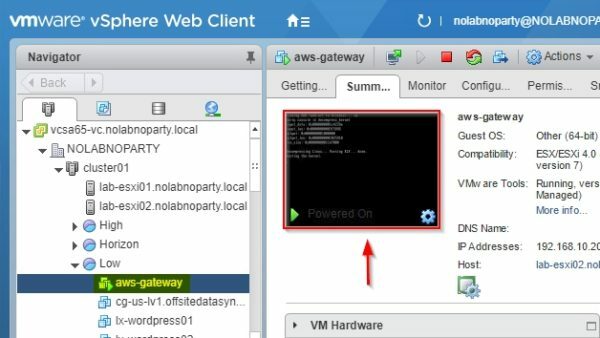 When the appliance IP address has been configured, go back to the AWS Management Console to complete the setup of the gateway. 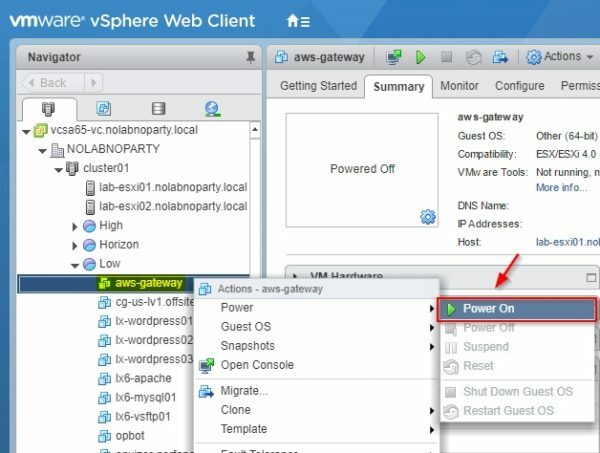 Enter the configured IP address and click on Connect to gateway button. 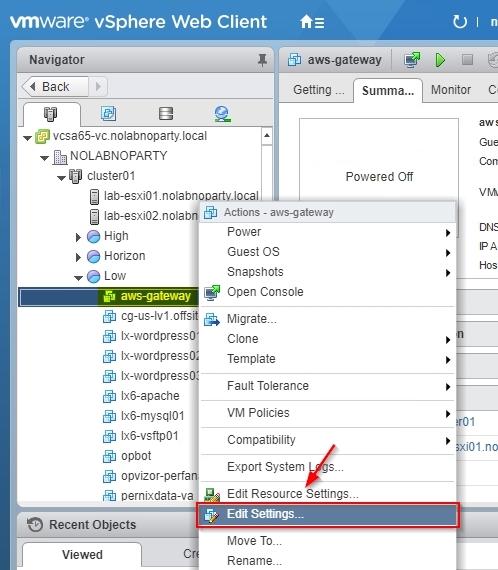 Specify the Gateway name and click Activate gateway. 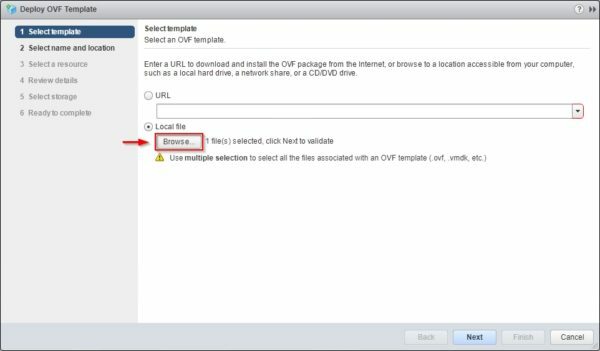 Once the gateway has been activated, choose the disk used for the cache then click Save and Continue. The AWS Gateway has been configured successfully. 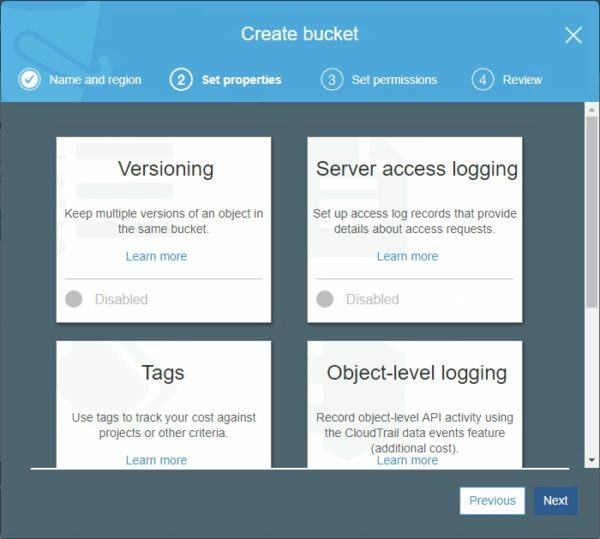 Next step is the creation of a S3 Bucket required to create a file share. 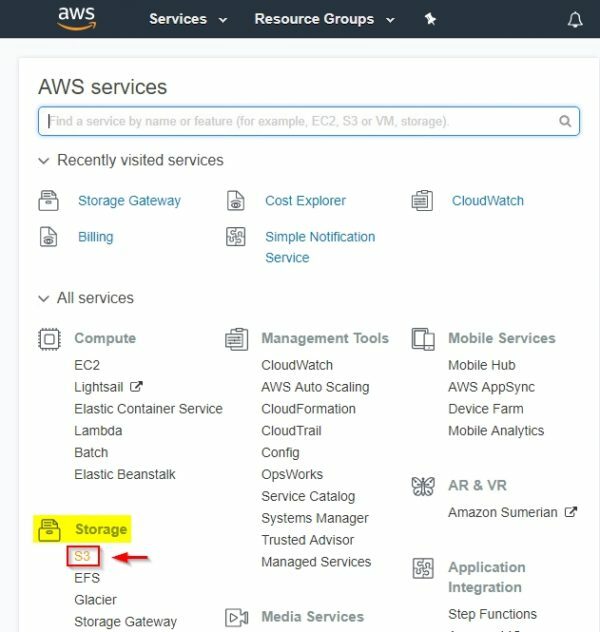 From the AWS Management Console, select S3 under Storage area. 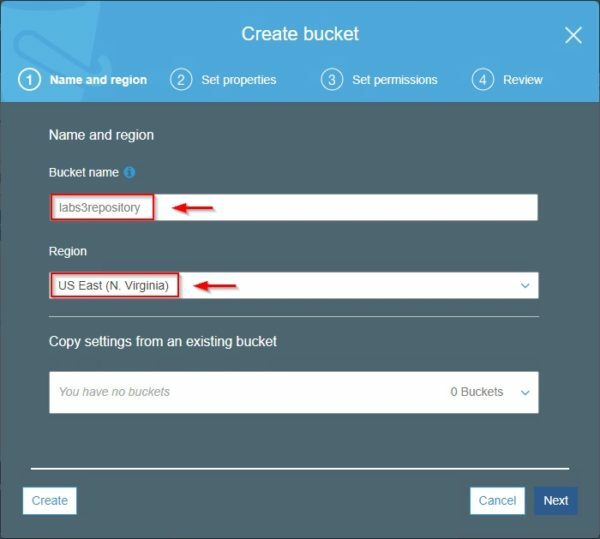 Specify the Bucket name and the Region then click Next. If you don't need to activate specific features, click Next to continue. Make sure your account has read and write permissions then click Next. 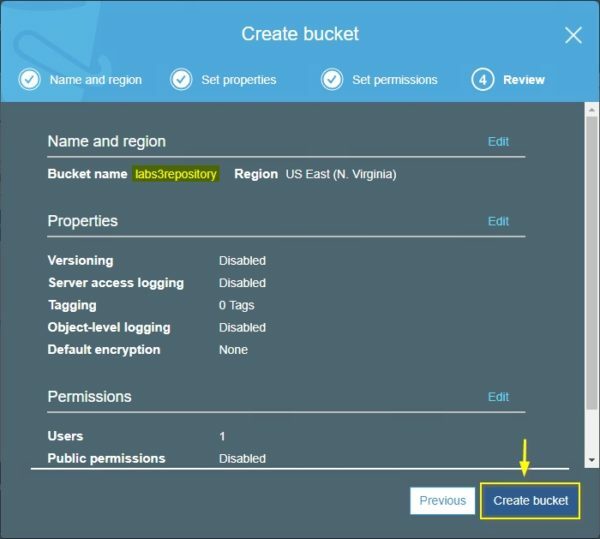 Double check entered configuration and click Create bucket. The new Bucket has been created. 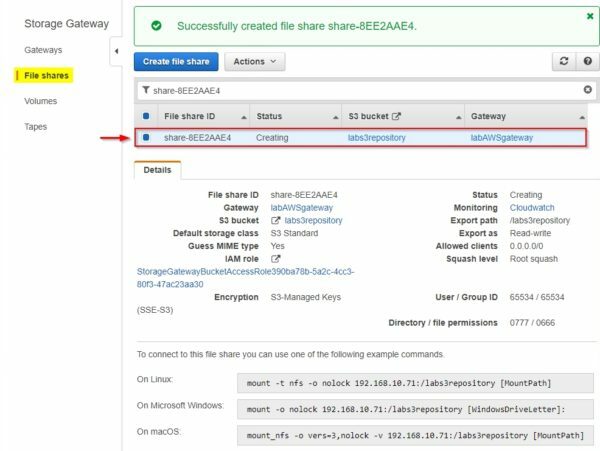 When a S3 Bucket is available to use, go back to the Storage Gateway configuration page and click Create file share. 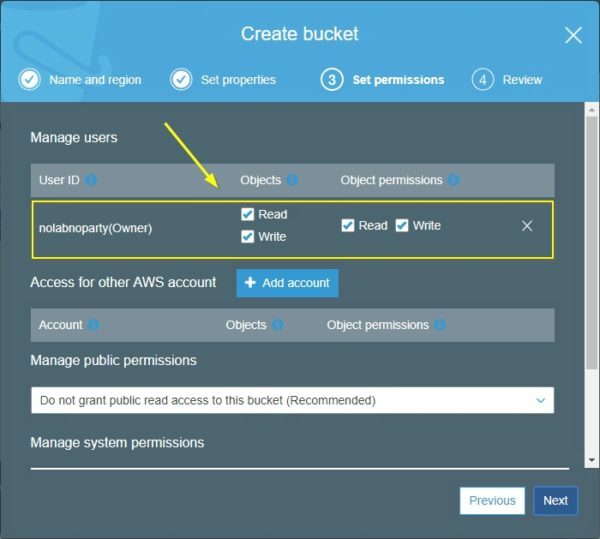 Enter the Amazon S3 bucket name and leave default options. Click Next. 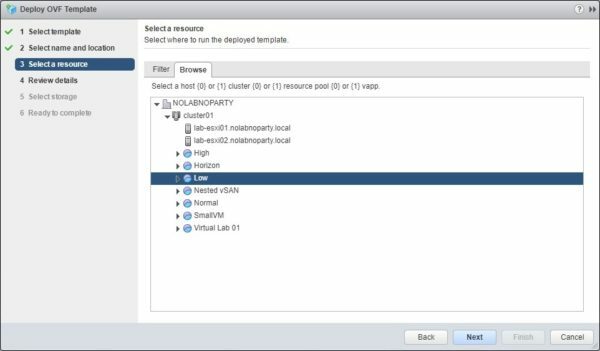 Allowed clients: the default value to 0.0.0.0/0 to allow the access from any IP. For security reasons, it is recommended to change this configuration. Squash level: by default, this parameter is set to Root squash. 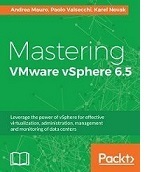 Double check the requirements for the used software. 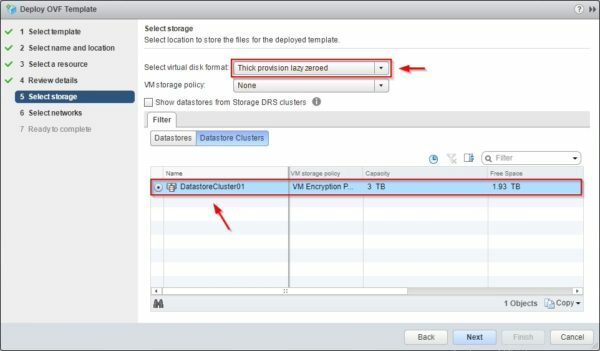 Click Create file share to save the configuration. The file share has been created successfully. 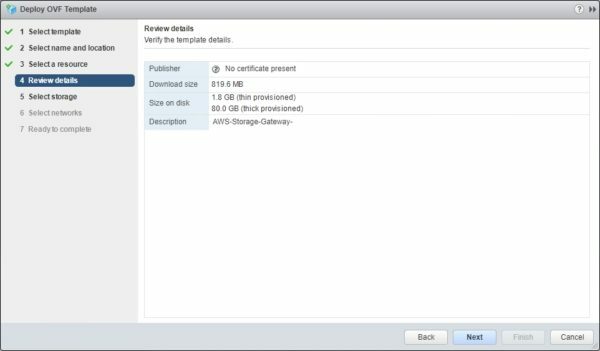 The AWS environment is now configured to use Amazon S3 as offsite storage or, for example, as external backup repository. Thanks for the Article. 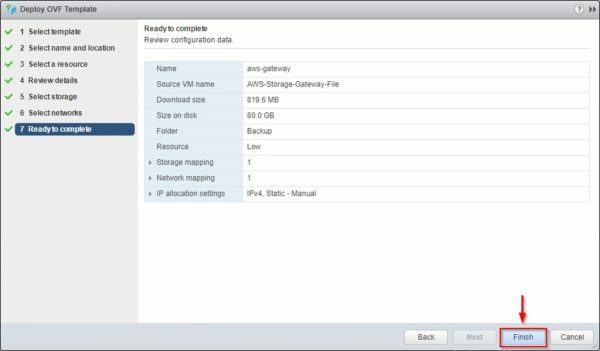 The problem with StorageGateway is whenever you have an object available in S3 it is not getting synced to the FileShare. Do you have any recommendation ?